The Days of Johann, an agility dog! : Thinking of our fellow four leggers! Thinking of our fellow four leggers! We've been Twittering and blogging over at Rescue Me about animal rescue and shelter news and information during the recent hurricanes. I just can't imagine what all the people, animals and pets have gone through this season. We've shed a few tears for our fellow pups, as we've written about them. We had to share one of the most touching photos we saw while searching for news and updates. This one. 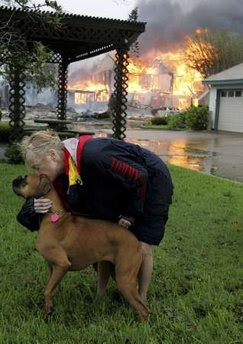 Frederika Kotin kisses her dog Belle as her home burns behind her after Hurricane Ike hit Galveston, Texas September 13, 2008.
w00f's Johann and Gracie, just goes to show us, watt is most important in our lives..
That would be my mom!! This is a pawsome photo. Mama and Papa feel that way about us. Touching photo. Lots of sad stuff going on down there. I came overe to your blog from Lacy Lulu's blog.. that is one touching picture. It reminds me of the cover of a book (can't remember the name now) that's dedicated to the animals who were rescued during Katrina. We saw that elsewhere but didn't know the information you have with it. Knowing why she is kissing the dog makes it even more precious. That is so sad! That would be our mum if something awful like that happened here. Johann, we are in Australia, but it sounds like there are so many problems in the US at the moment and our mum would like to help these poor puppers with donations from her rescue project(www.dogpaintings.com.au).